My philosophy is that if you create with what you love in mind, you – and others – will always love what you create. 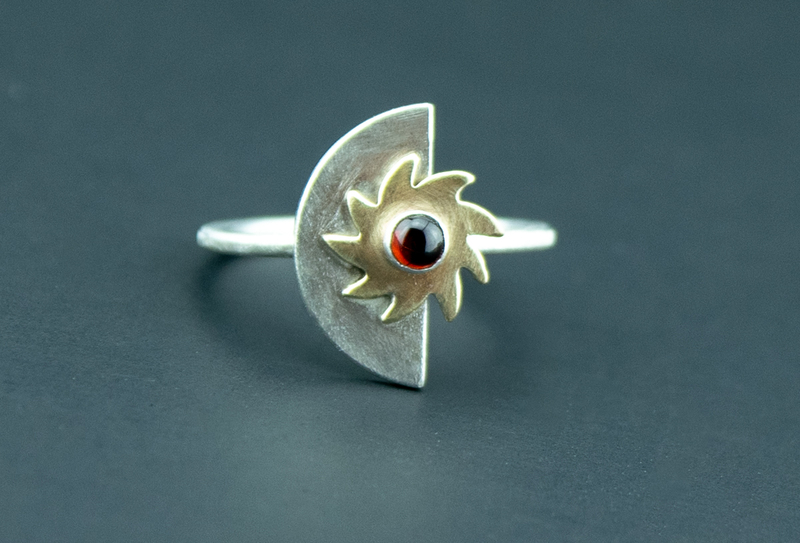 Are you looking for ways to incorporate things you love to do into your jewelry design? I have found that when I create with something that I love in mind, the ideas come freely and make me smile! Recently I told you about my connection with autism and I wrote about the trend to personalize jewelry more and more in recent years. One way to do that is to incorporate what is important to you in your designs. It could be something as simple as your favorite color(s), animals, travel destinations and hobbies. One of my favorite things to do is yoga. I came to yoga relatively late. Sure, I had heard for years that it was good for a variety of reasons, like increased flexibility, range of motion, pain reduction and most importantly stress relief. And who couldn’t use all of that? Why? The regular practice of Kim’s style of yoga has given me all the benefits promised and then some. 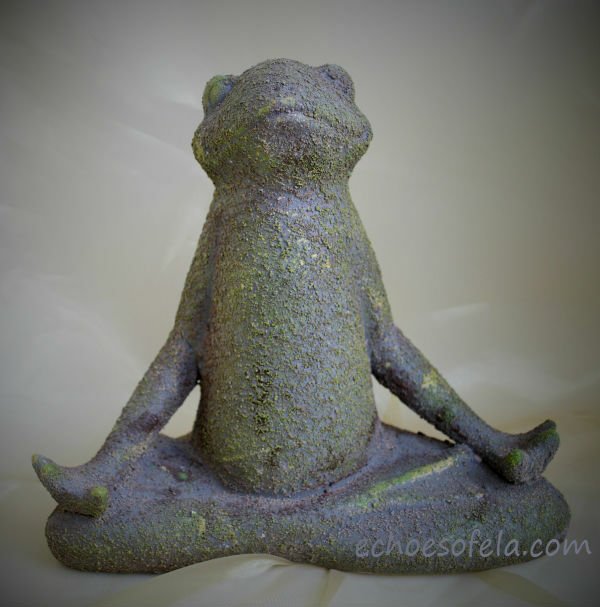 It has given me the tools I need to calm and de-stress, to focus when it seems like I am putting out one brush fire after the next and to relieve my aches and pains from sitting at my work bench creating sparkly goodies! Please feel free to check out her website here! Naturally I wanted to express my love for yoga through my artistic medium, which is jewelry, of course. So I decided to come up with several designs that incorporate the colors of the chakra, better illustrated and explained here. 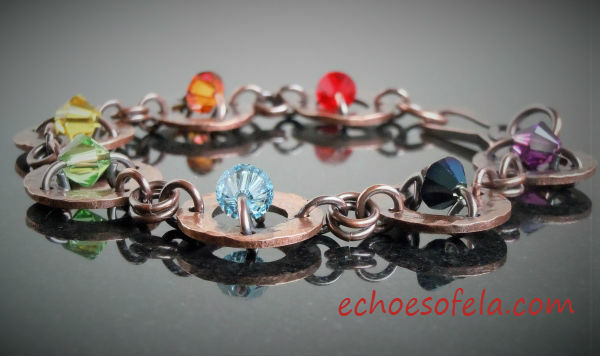 I chose copper washers for this bracelet because copper has a wonderful, warm feel and its patina harmonizes beautifully with those gorgeous rainbow hues. 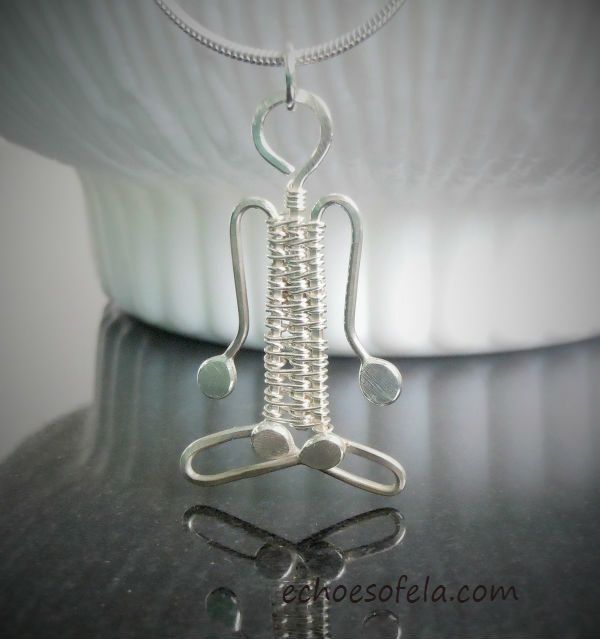 One day when I was playing around with various wire weaving designs, it dawned on me that I could manipulate them into little yoga people in various poses. And that is how this pendant came about! I am always tweaking and fiddling to improve upon the original and I have a couple of small changes planned for this design. I have several different pendants of poses in my Etsy shop with earrings coming soon! 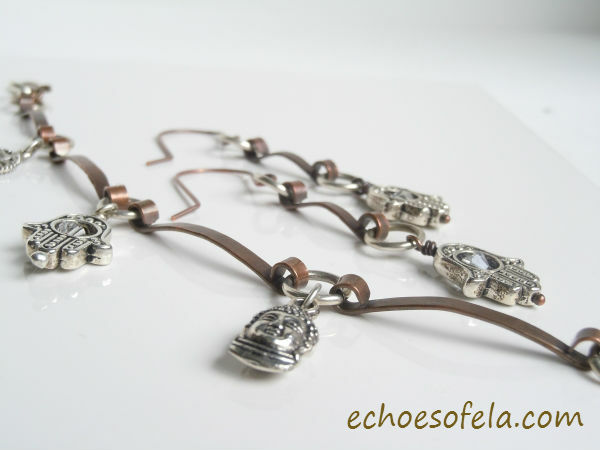 The third example is a mixed metal bracelet and earring set in which hammered copper bars are connected by silver jump rings, which in turn serve as anchors for several different silver plated yoga themed charms. So there you have it – one of my many inspirations! What are yours? Do you create with a specific subject in mind? Do you buy jewelry that has a theme? To me it just gives me yet another chance to incorporate things that make me happy into my everyday life!